m. SARAH DUKE b circa 1760 m. 21 Oct. 1781 Lurgashall, Sussex. Woolavington, Sussex. m. HARRIOTT HERSEY b. circa 1786 ? Easebourne, Sussex. c. 7 Apr. 1786 Easebourne, Sussex. m. 19 Jul. 1810 Easebourne, Sussex. MARY WEST b. circa Dec. 1787 ? Easebourne, Sussex. c. 5 Jan. 1788 Easebourne, Sussex. WILLIAM WEST b. circa Mar. 1790 Easebourne, Sussex. c. 18 Apr. 1790 Easebourne, Sussex. m. SOPHIA HERSEY b. circa 1794 Easebourne, Sussex. c. 8 Sep. 1793 Easebourne, Sussex. m. 21 Jul. 1814 Easebourne, Sussex. d. circa Jun. 1868 ? Fernhurst, Sussex. bur. 17 Jan. 1868 Fernhurst, Sussex. SAMUEL WEST b. circa Mar. 1793 ? Easebourne, Sussex. c. 21 Apr. 1793 Easebourne, Sussex. JAMES WEST b. circa Nov. 1798, Easebourne, Sussex. c 2 Dec. 1798 Easebourne, Sussex. d. 1864 m. ELIZABETH HILLS b. circa 1801 Lodsworth, Sussex. m. 13 Sep. 1824 Lodsworth, Sussex. d. 1881. ANN WEST b. circa Oct. 1802 ? Farnhurst, Sussex. c. 7 Nov. 1802 Farnhurst, Sussex. HANNAH WEST b. 1826 Farnhurst, Sussex. c. 25 Dec. 1826 Farnhurst, Sussex. d. 1866 Brighton, Sussex m. STEPHEN GREENWAY/GREENAWAY 25 Dec. 1848 Farnhurst, Sussex b. circa 1823 Farnhurst, Sussex. Stephen m. (2) ELIZABETH SHELLEY Brighton, Sussex 1867 b. circa 1827 Scotland. In the 1867 edition of Kelly's Post Office Directory of Essex, Herts, Middlesex, Kent, Surrey and Sussex John West, Coal Dealer was listed as running his Coal yard business at 4 Cheapside in Brighton. JAMES WEST b. 1830 Farnhurst, Sussex. c. 2 Jan. 1831 Farnhurst, Sussex. m. SOPHIA WEST b. circa 1829 ? Farnhurst, Sussex. c. 19 Jul. 1829 Farnhurst, Sussex. m. 2 Jun. 1855 Farnhurst, Sussex. THOMAS WEST b. circa 1832 Easebourne, Sussex d. bef. 1881 m. EMILY PARSONS 10 Jun. 1858 Appledram, Sussex b. circa 1826 Appledram, Sussex. ELIZABETH WEST b. circa 1834 Easebourne, Sussex d. circa Mar. 1874? Fernhurst, Sussex bur. 22 Mar. 1874 Fernhurst, Sussex m. CHARLES VENES 26 Dec. 1868 Farnhurst, Sussex b. circa 1825? Old Henley, Sussex c. 4 Sep. 1825 Easebourne, Sussex d. circa Feb. 1901? Fernhurst, Sussex bur. 1 Mar. 1901 Fernhurst, Sussex. WILLIAM WEST b. 13 Mar. 1836 Easebourne, Sussex. d. 15 May 1908 Stedham, Sussex, a carpenter and timber merchant m. ANGELINA MANSFIELD daughter of a dissenting minister 26 Dec. 1859 Farnhurst, Sussex b. 7 Aug. 1838 Hascombe, Surrey. d. 3 Mar. 1890 Stedham, Sussex. RICHARD WEST b. circa 1839 Easebourne, Sussex m. RUTH CHASE b. circa 1847 m. 28 Feb. 1884 Fernhurst, Sussex. LUKE WEST b. circa 1840 Farnhurst, Sussex. m. MARY ANN SIMS b. circa 1844 ? Berkshire m. 3 Sep. 1868 Farnhurst, Sussex. RUTH WEST b. circa 1842 Farnhurst, Sussex. SARAH WEST b. circa 1845 Farnhurst, Sussex. JULIA WEST b. 1853 Brighton, Sussex. MERCY ELIZABETH WEST b. 4 Dec. 1854 Brighton, Sussex. EMILY LYDIA WEST b. 1856 Brighton, Sussex. MARTHA EMMA WEST b. 1858 Brighton, Sussex. ELLEN MARY WEST b. 1859 Brighton, Sussex. JOHN JAMES HENRY WEST b. 1861 Brighton, Sussex. d. 1897. LYDIA RUTH WEST b. 1862 Brighton, Sussex. d. 1917 m. GEORGE HARRIS b. 1861. ROSE SARAH WEST b. 1866 Brighton, Sussex. RUTH CAROLINE WEST b. 1869 Brighton, Sussex. d. 1952 Philadelphia district, USA? m. GEORGE GILBERT DAY migrating to the USA mid 1890s returning to Brighton, Sussex before circa 1902 returning to the USA before the US 1910 census. Children: NELLIE RUTH DAY b. 1891 ENGLAND d. 1975 m. GEORGE CHRISTOPHER RAPP b. 1888 d. 1952. Had issue GEORGE GILBERT RAPP b. 1916 and STANLEY RAPP. GEORGE WINFIELD DAY b. 1898 USA. SAMUEL CHARLES DAY b. 1900 USA d. 1905 ENGLAND. ELIZABETH RUTH DAY b. 1902 ENGLAND d. 1974. CHARLES ALFRED WEST b. 6 Nov. 1870 Brighton, Sussex. d. 22 Aug. 1955 Brighton, Sussex. m. BEATRICE BALDEY b. 24 Nov. 1877 Fulking, Sussex. m. 5 Dec. 1897 Brighton, Sussex. d. 19 Dec. 1957 Brighton, Sussex. CLARA HANNAH WEST b. 1874 Brighton, Sussex. d. 1898. CLARA ELEANOR WEST b. 21 Jan. 1898 Brighton, Sussex. d. Jan. 1983 m. GUSTAV EMIL LARSSON (JOHN) 14 Aug. 1919 Brighton, Sussex b. 26 Dec. 1892 near Goteborg, Sweden d. Jul. 1963 Brighton, Sussex. CHARLES PERCY WEST b. 6 Nov. 1899? Brighton, Sussex. d. 31 Oct. 1979 Kingsteignton, Devon m. (1) KATEY/KATE ? Brighton, Sussex d. 7 Jul. 1955 Brighton, Sussex, m. (2) GWEN ? b. Birmingham district, Warwickshire. Charles served in the Royal Sussex Regiment. (Charles and Katey/Kate West ran a Newsagency in George Street, Hove for many years). HARRY LIONEL WEST b. 11 Dec. 1900 Brighton, Sussex. d. 15 Mar. 1979 Bristol Avonmouth m. NELLIE CAROLINE PAGE 11 Jun. 1938 Prestonville, Brighton, Sussex b. 29 Oct. 1904 Shoreham, Sussex d. 26 Jun. 1971 Bristol, Avonmouth. BEATRICE ROSE WEST b. 16 Mar. 1905 Brighton, Sussex. d. 24 Dec. 1986 Brighton, Sussex. JACK STANLEY WEST b. Brighton, Sussex. m. RITA? MILLICENT MAY WEST b. 23 Sep. 1910 Brighton, Sussex. d. 22 Dec. 1978 Patcham, Sussex. m. THOMAS JOHN JONES 4 Oct. 1939 Eastbourne, Sussex b. 29 Sep. 1912 Bootle, Liverpool, Lancashire, d. 20 Feb. 1988 Cuckfield, Sussex. OLIVE DORIS WEST b. 6 Nov. 1915 Brighton, Sussex. d. 16 Dec. 2003 Grantham, Lincolnshire, m. RONALD STANLEY MALTBY BROOKS 7 Jan. 1939 Brighton, Sussex b. 18 Jan. 1911 Hove, Sussex d. 8 Aug. 1996 Hove, Sussex. KATHLEEN WEST b. 19 Dec. 1919 Brighton, Sussex. d. 19 Dec. 1996 Brighton, Sussex. m. JOSEPH ROBERT SAYERS 19 Jun. 1947 Brighton, Sussex b. 17 Sep. 1913 Brighton, Sussex, d. 1 Aug. 2010 Worthing, Sussex. ROY ALFRED WEST b. 22 Jul 1922 Brighton, Sussex. d. 5 Jul. 1984 Brighton, Sussex. m. MADGE HOOK 23 Jul. 1955 Hove, Sussex b. 1 Mar. 1931 Haywards Heath, Sussex. MARGARET ANNE JONES b. 2 Jul. 1944 Brighton, Sussex. m. NORMAN MORLEY, Patcham, Sussex. TREVOR JOHN JONES b. 18 Mar. 1950 Brighton, Sussex. m. DOREEN JOAN FORDHAM b. 30 Oct. 1946 m. 27 Oct. 1973 Patcham, Sussex. GLEN PETER JONES b 14 Jul. 1971 Werribee, Victoria, Australia m. TRUDI MARIE LAWFORD 25 Jan. 1997 Casterton, Victoria, Australia b. 25 Oct. 1976 Casterton, Victoria, Australia. JAMES WEST - 'REEVE OF THE MANOR OF COWDRAY'. 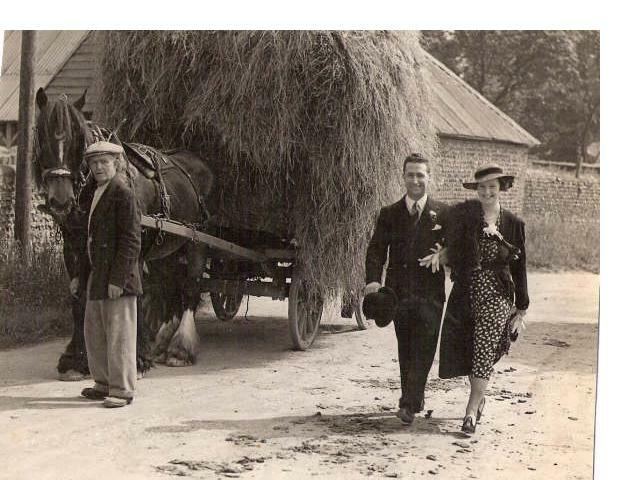 James West, my maternal great-great-grandfather, was born in Easebourne in the far North-West of Sussex. In 1837 which was the first year of the reign of Queen Victoria, the Parish of Fernhurst, which had a population of between 700-800 held a Beating the Bounds. One of 32 Recorders and Walkers was James West of Henley Hill who was the 'Reeve of Cowdray Manor' and possibly also 'Verdley Manor' . On 16th March, 1840 North Ambersham also held a 'Beating the Bounds'. Amongst those present when they started were James West of Henley Hill Reeve of the Lord of the Manor, James' son John aged 12 (my great-grandfather) and Alexander Brown of Easebourne Priory, Land Agent for Pointz Esquire, Lord of the Manor. In the 1881 census one of his sons, Luke West's occupation was given as a 'Woodreeve'. Luke was living with his family at 'The Beeches' which may have at some time previously been called 'Verdley Edge'. A 'Woodreeve' or 'Woodard' was a steward or overseer of a forest or wood. In the 17th century much of England was covered in dense forest which had remained undisturbed over the centuries. However there was concern that trees were being removed from public land and the majority of freemen decided to appoint a board of Woodreeves or Woodards who then assigned what trees people could remove from the common land. This prevented wastage of timber by indiscriminate destruction of the trees and showed a great amount of foresight and regard to the following generations as well as their own interests. Over several centuries in such places as the New Forest in Hampshire some tenants were permitted to gather a certain amount of firewood from the forest. Beating the Bounds is an ancient old custom which goes back many centuries, long before maps were readily available and Ordnance Survey provided maps marking Parish boundaries. It was the custom during Rogationtide which is the 5th week after Easter for villagers together with the Rector and other local dignitaries to circumnavigate the Parish boundaries. The children would carry willow wands to beat the markers with and checks would be made to see that the stone markers were correctly in place. The custom is still observed in many English Parishes today. John West, my maternal great-grandfather, was born in Farnhurst in the far North-West of Sussex in 1828. In the 1851 census John was living with his family in Henley Common, Farnhurst and he and his younger brothers, James and Thomas were working as Labourers in the Wood. However he soon moved to Brighton and was living at 45 Kemp Street and employed as a Watchman at the Railway, the London to Brighton railway line having been opened in 1841. On 22nd August, 1852 John married Elizabeth Sarah Mercer at St. Nicholas Church in Brighton. Elizabeth was living with her family at 39 Kemp Street and worked as an Ironer and her father James Mercer was a Coach builder. In the 1867 edition of Kelly's Post Office Directory of Essex, Hertfordshire, Middlesex, Surrey and Sussex John West, Coal Dealer was listed as running his Coal Yard business at 4 Cheapside, Brighton. Charles Alfred West, my maternal grandfather, was also a professional musician who played the Concertina in Brighton. He and Tom Bridger a fellow busker used to play their Anglo Concertinas on the Brighton beach and the promenade above it. They had a regular pitch for which an annual licence of One Pound was charged. Either Charles or Tom played on the Collins' "Skylark", a pleasure boat, from time to time. During the evenings Charles and Tom would split up and play in separate public houses. In Michael Kilgariff's book, 'Sing Us One of The Old Songs' Charles West is listed as singing the following two (2) songs: "The Skipper's Farewell" by F.V. Saint Clair arranged by Chas. E. Jeffery in 1898 and "The Scapegrace of the Family" which is also known as "The Black Sheep of the Family" by Fred J. Barnes in 1909. Charles is also mentioned in one of the two volume set of books "The Anglo-German Concertinas : A Social History" by Dan M. Worrall published in 2009. During the First World War many hundreds of Indian soldiers who were injured whilst fighting in France were brought to Brighton for treatment where they were nursed in one of the three (3) Indian military hospitals that were set up in the Royal Pavilion, the Workhouse which is now the Brighton General Hospital and the York Place Schools. Charles used to play his Concertina for the wounded soldiers in the Royal Pavilion Hospital and possibly the other military hospitals. 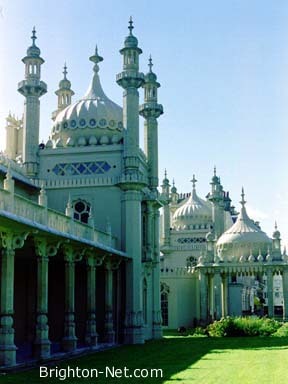 The southern gateway to the Royal Pavilion was a gift from the citizens of India to the people of Brighton and Hove in gratitude for caring for their injured soldiers. His Highness the Maharaja of Patiala dedicated and unveiled the new southern gateway to the Pavilion on the 26th October, 1921. The Concertina is a small hexagonal shaped bellows blown instrument which together with the Accordian and Harmonica is a member of a group of instruments known as "Free Reed Instruments" and was invented in 1844. A sound is produced when the air is squeezed from the bellows which lie between the handles and by pressing different buttons with the fingers the pitch of the note is changed. The Concertina's popularity was widespread in the latter half of the 19th century and the Russian composer Peter Ilyich Tchaikovsky used four (4) Concertinas in his second orchestral suite. Regrettably the Concertina appears to have been confined to folk music. 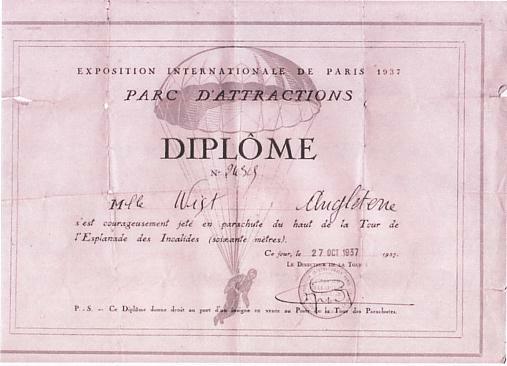 In October, 1937 my mother Millicent May West visited France for the World Exposition in Paris and whilst there on 27th October, made a parachute jump for which she received a diploma. 30 years later in 1967 and just one (1) year after leaving the Royal Air Force Music Services to join the Central Band of the Royal Australian Air Force the Band flew to Canada to take part in the World Exposition at Montreal. The 1937 World Exposition was held in the centre of the city of Paris in France between 25th May and 25th November. It was a particularly interesting Exposition with 46 nations taking part, the main point being to improve relations between them. One of the main objects at the Exposition was Pablo Picasso's painting "Guernica" on display in the Spanish Pavillion which created quite a sensation. 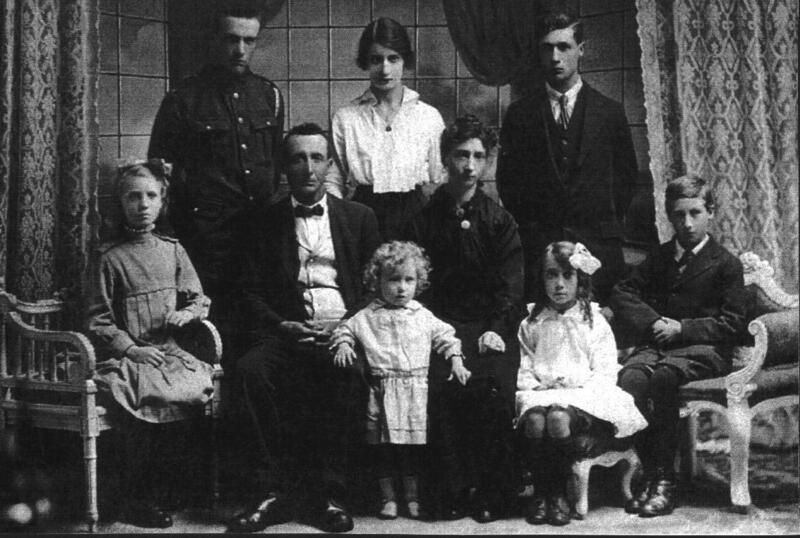 WILLIAM WEST, my great-great uncle with some of his family circa 1896. Two (2) of William's sons possibly wearing the uniform of the Royal Hampshire Regiment. 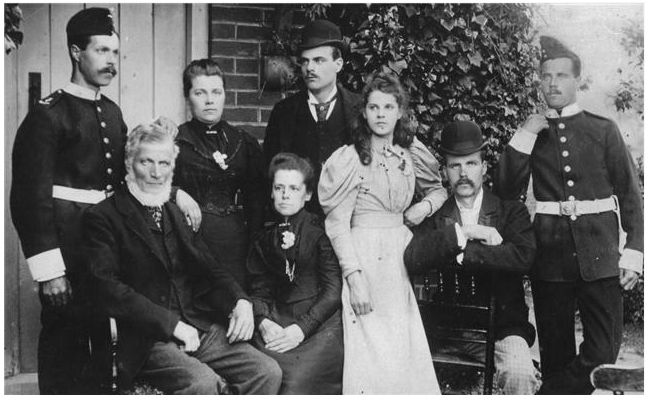 A family group photo taken in 1895 which includes my grandparents before they were married in 1897. 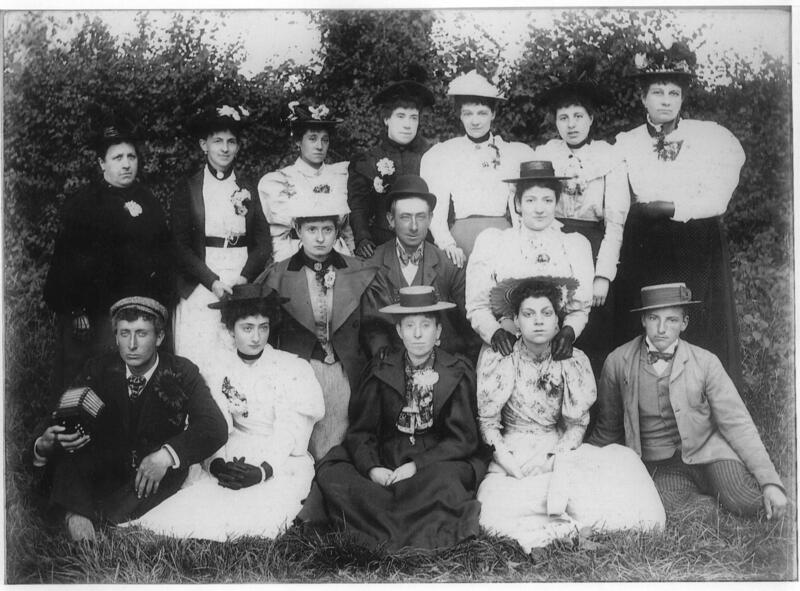 Far left front row: CHARLES ALFRED WEST (holding Concertina) and BEATRICE BALDEY (sitting next to him). Back Row L-R: CHARLES, CLARA, HARRY. Centre: CHARLES ALFRED WEST, BEATRICE WEST nee BALDEY. Front: BEATRICE, OLIVE, MILLICENT, JACK. WEDDING OF CHARLES WEST & KATEY/KATE? MID 1920s. 8. JACK WEST; 9. --; 10. -- . Middle Row: 1. --; 2. CHARLES WEST; 3. BEATRICE WEST nee BALDEY; 4. CHARLES WEST; 5. KATEY/KATE WEST nee ? 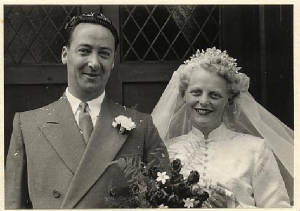 HARRY LIONEL WEST and NELLIE CAROLINE WEST nee PAGE on their Wedding Day 11th June, 1938. 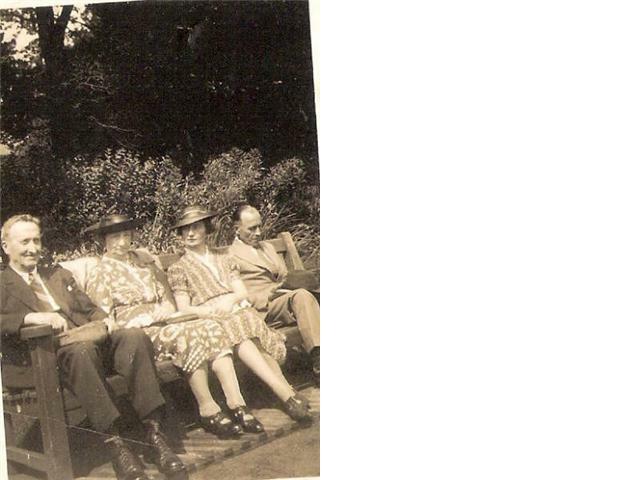 L - R: CHARLES ALFRED WEST, BEATRICE WEST nee BALDEY, CLARA ELEANOR LARSSON nee WEST and GUSTAV EMIL LARSSON. 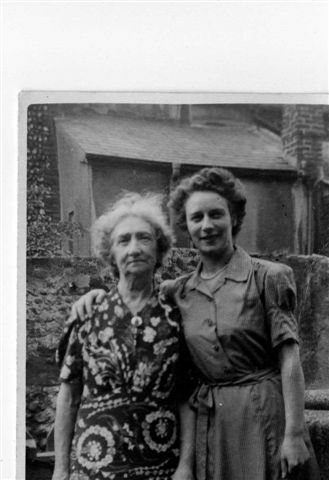 BEATRICE WEST nee BALDEY with youngest daughter KATHLEEN. 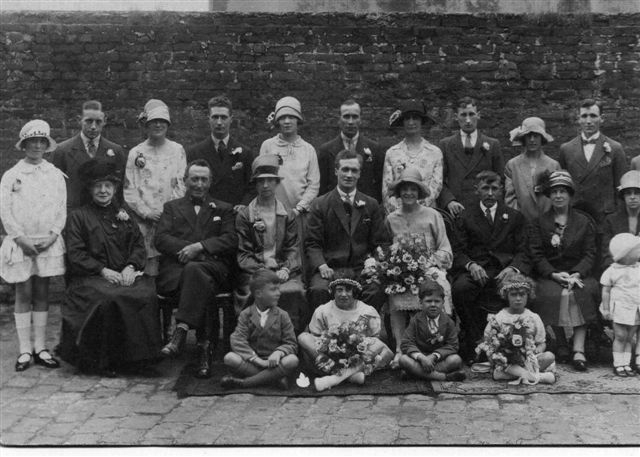 The Wedding of youngest son ROY ALFRED WEST and MADGE HOOK. 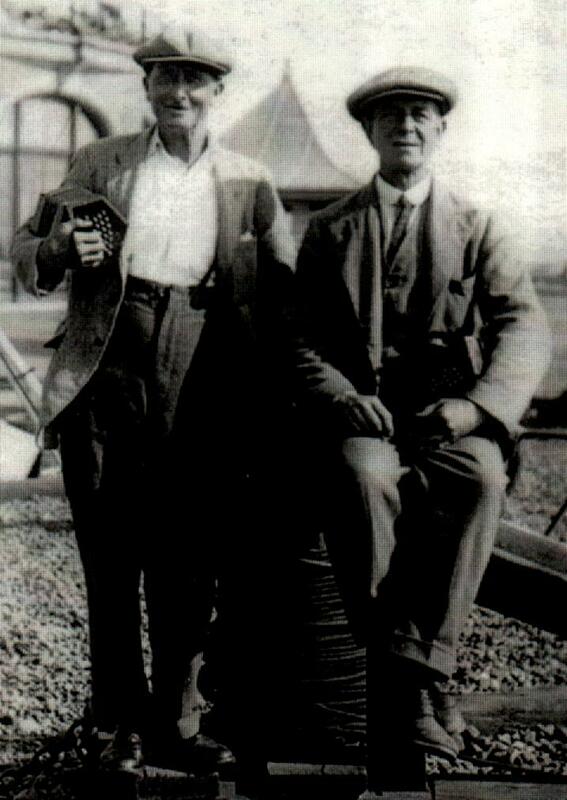 CHARLES ALFRED WEST with fellow Concertina player TOM BRIDGER on the seafront at Brighton, Sussex. 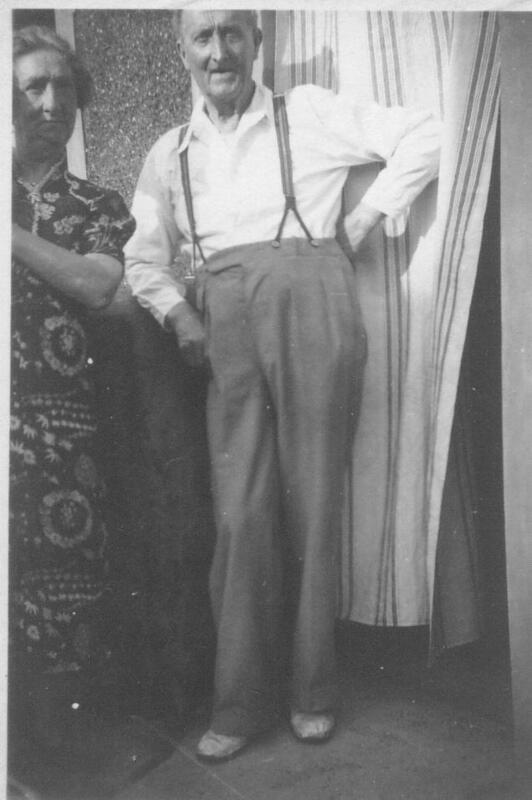 CHARLES and BEATRICE WEST at their home at 16 Albion Cottages, Brighton, Sussex. 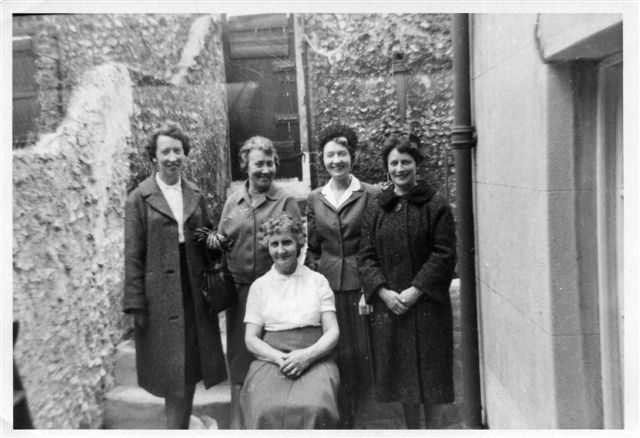 Standing L to R: OLIVE, MILLICENT, BEATRICE & KATHLEEN.